The title of this plan appears at top left, with an explanatory note at top right and compass star at bottom right. 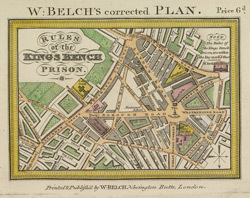 The first King's Bench Prison in Borough High Street, Southwark, was demolished in 1754. This rebuilt prison was mainly used for debtors and people convicted of libel.